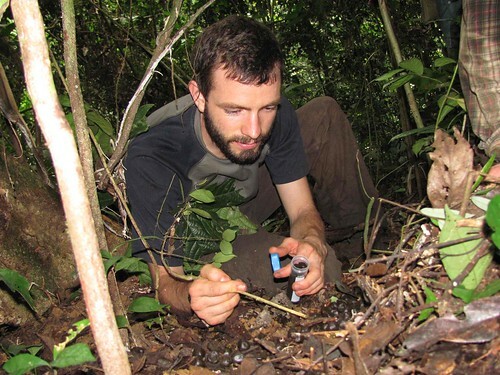 Hi, my name is Dave Stanton and I am a PhD student at Cardiff University, UK and the Zoological Society of London (ZSL). My PhD is on an animal called okapi, which is a rainforest giraffe that lives only in the Democratic Republic of Congo (DRCongo). I have teamed up with the TL2 project to try and find out more about this little known species in a part of the country called TL2 (the area between the Tshuapa, Lomami and Lualaba Rivers). 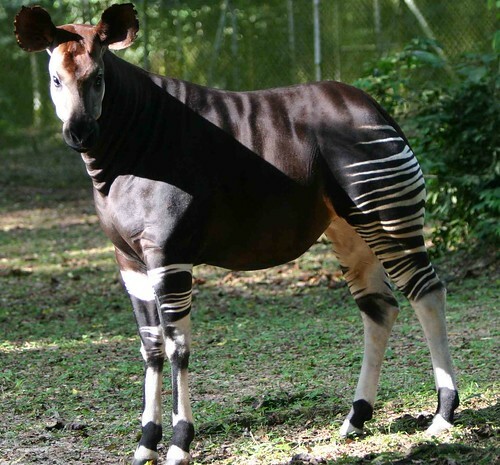 This is the incredible Okapi, big as a small horse, but a giraffe. photo credit: Kim Gjerstad. Okapis are a species under threat from habitat fragmentation, human encroachment and poaching. They are also highly elusive and nearly impossible to see in the wild. To get around this problem, I am investigating questions about okapi ecology and conservation status using okapi DNA from dung found in the forest, and skins of hunted okapi that we find in villages. Genetic analysis can give us information crucial to conservation such as home-range sizes, movement patterns, and how population fragmentation is affecting the species. For this expedition I will be heading into the southern half of TL2 on motorbike, bicycle and foot to survey villages about okapi presence. 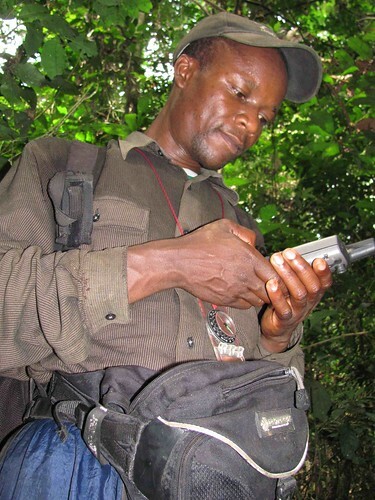 I will then be heading into the northern half of TL2 to carry out a survey in the remote “Tutu Basin” to look for signs of okapi and hopefully to collect some samples. At the moment I am in a town called Kindu, which is where this expedition will start. My first experience of Kindu is not a favorable one! I arrived with my assistant researcher, Chryso Kaghoma, on a UN flight. We had barely left the safety of the UN compound in Kindu when I was accosted by the head of the local immigration service (DGM). Despite already having my DRCongo visa, I am required to visit the immigration office. The head officer informed me that we have a “grand problème”. “This is very serious. A legal matter,” he tells me gravely. Despite only two options on the visa form that I filled out in London (transit and ordinary), in Kindu I need a “working visa” rather than the “ordinary” visa that I have. I am obliged to see what seems like every official in the building, one of whom is in a tiny wooden office, so small that after the assistant spent five minutes officiously squeezing a chair in for me, there was no room for me to get into it except by clamoring over the back! The DGM eventually tells me that he can sort out my “grand problème” if I give him $700. I definitely did not plan to do that! The next two days are spent trying to find a solution to my problem. I go for a meeting with the DGM and the provincial minister of environment, interrupted every couple minutes by the DGM’s dog–bark, ringtone cellphone. We eventually find a solution, which is to pay $100 to the DGM as a “fine”. Suddenly all my problems evaporate, I get my passport back from the DGM who had been looking after it. I am eager to leave for the forest. Next day: I head north and west from Kindu on a motorbike, wedged somewhere between my rather large driver, our extensive baggage and a live chicken. Welcome to my adventures in TL2. I have just had a pretty tough few days. I went out this week to investigate some rumours of okapi presence, taking off from the base camp of the Harts near a small forest village called Katopa. 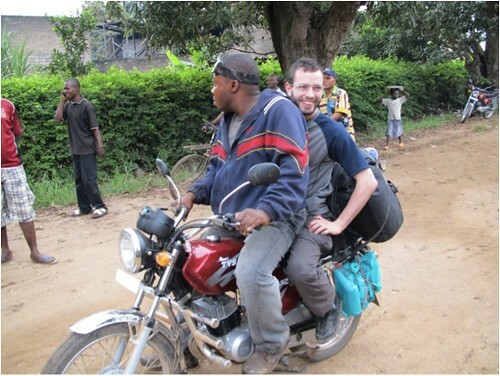 Just to get to Katopa in the first place was a motorbike ride followed by a very long day’s walk from Kindu. 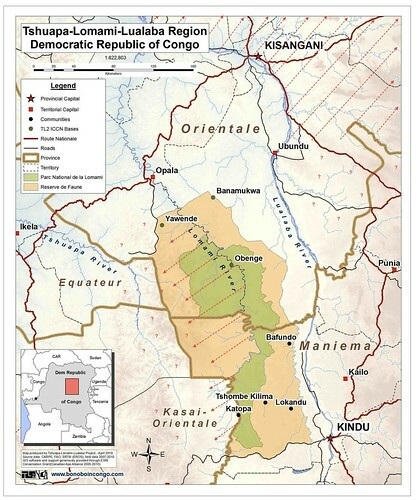 The okapi population in TL2 is incredibly important to investigate because it is on the west side of the Congo River and disjunct (or geographically distant) from the rest of the range on the east side. Okapi here are in very low numbers compared to elsewhere in their range, despite low hunting pressure, so it is important to find out why, if we want to conserve this species effectively. I am hoping to get some clues using genetics, but first I need samples! 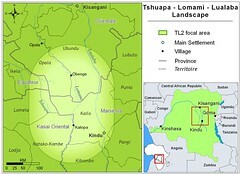 The arrows are approximate okapi distribution with questions around the margins and the mysterious area of absence between the Lomami and the Lualaba. I had started to get blisters on my heels from our walk a couple of days earlier – this was certainly not likely to help me with plenty of walking left to do! We arrived in a village called Etshuna late, put up our tents and passed out. We had a storm during the night and my hammock (great in the forest but not suited to villages) leaked. I had a very uncomfortable, wet night with little sleep. An early rise the next morning – we still had ground to cover. Drying the socks, to then slip on over the blisters, yet again. My friend and assistant, Kaghoma, who works for the Zoological Society of London, managed to rent us some bicycles to make the next leg of the trip a little easier – things were looking up! But not for long… We arrived in a village called Yosenge and were required to meet with the chief; a man sporting an all-blue adidas tracksuit, leopard tooth necklace and leopard-skin hat. We were told that we could not go any further without a meeting between this chief and the chiefs of six other villages of the region. This meeting would decide whether we were allowed to proceed or not and would take weeks to arrange – totally unfeasible with our schedule! This was a huge disappointment. 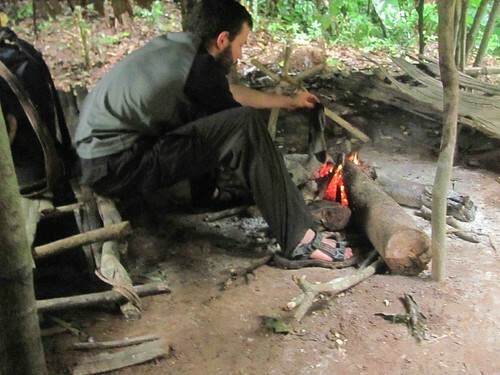 Without any alternative, we had to turn around and go back to our camp at Katopa… Gutted! Source of frustration…a chief with complicated protocol. However, all is not lost! We gained some valuable information on locations of okapi from the villagers at Yosenge that we should be able to follow-up at a later date. At some point I am hoping that we will even be able to collect some okapi skins from hunters in the TL2 region. Skins are valuable sources of DNA as it is usually of a higher “quality” than dung DNA. This may allow us to study genes within the Okapi genome that relate to habitat, perhaps help us to understand why Okapi are in some areas but not others. It will also give us a better idea of how different okapi in TL2 are from okapi the rest of their range. The Congo River is an important barrier limiting the range of many species, and it may be that okapi either side of this huge river differ more than we thought. Thank goodness for Kaghoma’s good spirits,competence and great endurance. We are currently loading up our dugout (traditional Congolese canoe, hand carved from a single tree trunk) for our descent of the Lomami River. I’m starting to feel a little better, and very excited about the trip ahead and our mission into the Tutu Basin! I have spent the last couple of weeks in the Tutu Basin in TL2 searching for signs of okapi and trying to find samples for my project on Okapi genetics. I’m pleased to report that I have had more success than my last mission out in Sankuru! 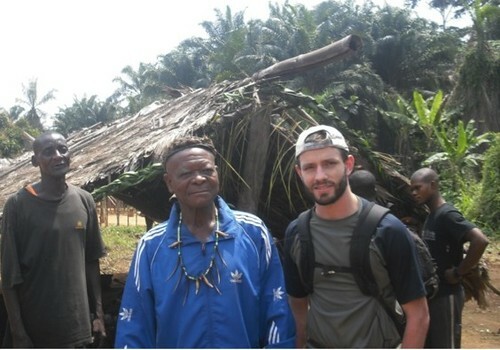 This mission started with a three-day, dugout trip up the Lomami River, one of the main tributaries of the Congo River which is also one of the most remote places left in the world! 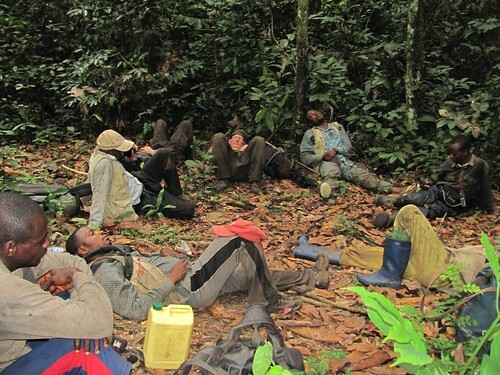 This was a fantastic chance to see one of the world’s last true wildernesses, along with all manner of incredible birds, primates, bats and insects. Rest stop. David’s knees are in the far back, next to John, on left side of photo. Day 1. Today we set out on our expedition to try to verify and locate Okapi presence in the Tutu Basin. John and I have planned a basic route on Google Earth that takes us past some edos, openings in the forest where tracks are easier to see. The TL2 project has a small research camp, Losekola (link), from which we launched and that is only about a three-hour walk from Obenge. We left about midday. The moment we started walking there was a big clap of thunder and it started pouring rain. It rained all afternoon and night. The camp is nice, though, and we spent a comfortable night. This was more like it — dung for the taking. 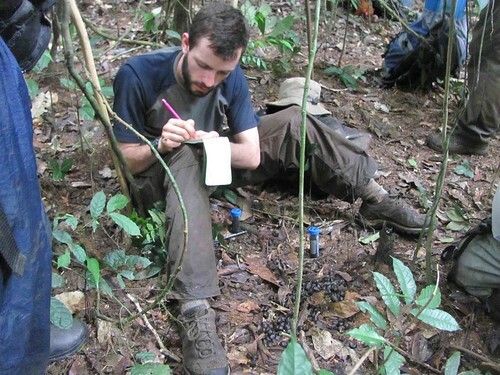 Once back in Obenge I have a look through what we managed to get from our mission; five dung samples and some information on okapi presence throughout the Tutu Basin from a week of hard walking. May not seem like a good pay-off, but this was actually more than I expected! It just goes to show how infrequent Okapi must be in this area. With a few more samples I will be able to start using genetics to investigate questions important to okapi conservation. The first step is to get a unique genetic fingerprint, or “genotype” for each okapi individual. One of the things we can then investigate is how related the individuals are to each other, and see what features, such as rivers, villages and habitat-type affect this relatedness. Look closely — there’s an okapi in this picture and quite close. No wonder they are rarely seen. 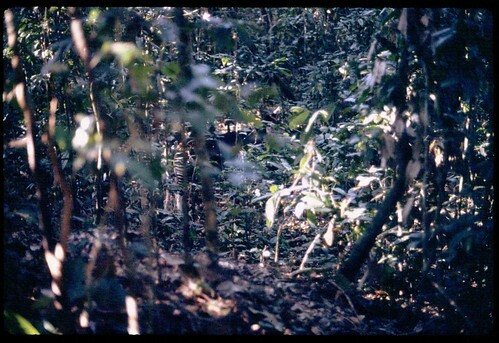 This photo from the Harts’ radio collar study in the Ituri Forest – late 1980s. The genetic information can then be used to advise the new protected areas as to how best to protect their Okapi population – all this from a few piles of dung!! Our trip also brings home how big the task is ahead of me – I am trying to genetically characterize this species throughout its range and this expedition covered only a very small part of that area! I’m determined to make it work – wish me luck! Addendum: After Dave left the TL2 study area, two of our TL2 researchers, Mpaka and Louison, went north to Rubi Tele to try to collect okapi dung samples from that protected area. They got samples from three dung piles and one dried skin. Their is a new energetic effort to protect Rubi Tele Reserve but the challenge is great: hunters consider it their forest. Okapi and all other mammals are seriously threatened. This entry was written by Terese Hart, posted on 2011-09-29 at 2:22 pm, filed under About the project, Okapi. Bookmark the permalink. Follow any comments here with the RSS feed for this post. Post a comment or leave a trackback: Trackback URL. Great account of your expedition. All the best with your project, I hope you get to see one of these wonderful creatures one day soon…. this strange distribution patterns can be seen on some monkey species as well, for example owl-faced and the new closely related lesula. Is it possible that the area on the western side of the lomami is a refuge area where some terra firma forest survived in drier (or wetter? ?->expansion of swamps) climatic conditions. If so, your work is extremely important for biodiversity conservation. Fascinating blog as per usual. I have donated. Very exciting research, thanks for posting. I have some info on okapis in the Buta-Aketi region (between Rubi-Tele and the Uele River) if it would help. See: http://www.wasmoethwildlife.org/folder2007-2008/part2/index.html pages 17-24. Best of luck Dave. Are you on facebook, I’d like to follow your discoveries. Great Blog,exciting research,can I follow you somewhere?? Living in Kindu since 06 years; I’m of North-Kivu origin and spent another part of my childhood between shared Goma and Bukavu. I then visited the Virunga Park with my Secondary School mates then the Kahuzi Biega Park. I seize this opportunity to thank you for this effort, which I am sure will enable Maniema Children respect the Nature and enjoy the Park Project you are working on. I would volunteerly be glad to accompany you in one of your trip and may offer to make video footage for free, since I’am a trained video operator (at Kisangani RTNC since 2001). Great to hear from you. We definitely could use help with videos. Lets talk about it in January when we will be back in Kindu. Do you know Salumu Madimba? You can contact him to be sure that we get together. It’s wonderful to find your amazing blog, and to see that for you and John the adventures continue! And for the wildlife of Congo, it’s wonderful that your hard work continues, too — of course! Kudos! I am wondering whether and how I might be able to send you and John a copy of my book, which has finally been published. 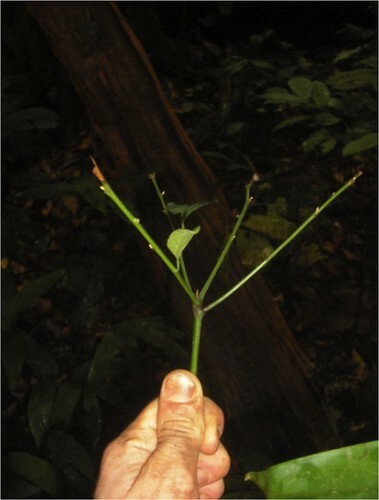 (It is based on my dissertation, in SE Cameroon. But of course, it all began under your roof, in the Ituri Forest, so long ago!) Is there a chance I could mail it to you before you head back to Congo? It would be wonderful to be back in touch again! All best wishes for a happy new year!